Eastern Conference Wild Card Race Heats up Tonight With Three Tough Matchups - The Point Data-driven hockey storytelling that gets right to the point. With three games left in the season for the majority of teams, most of the playoffs spots have been secured. However, that’s not the case for the Eastern Conference wild-card race. The Blue Jackets, Hurricanes, and Canadiens are separated by a mere two points and all have three games remaining. All three teams are active tonight and have drawn some of the league’s hardest matchups. Escaping with points tonight could mean the difference between a playoff spot or an early summer. 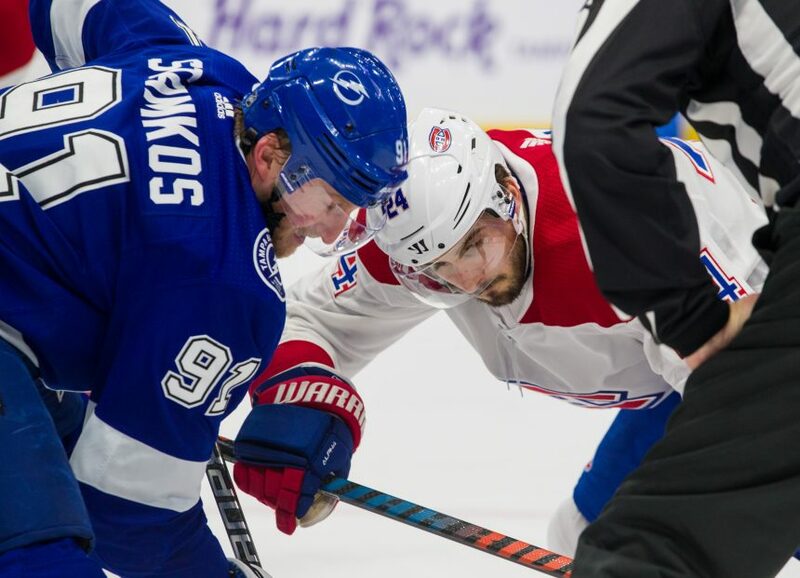 The Canadiens are on the outside of the playoff picture looking in at the moment and they also draw the toughest matchup in the league, the 60-win Tampa Bay Lightning. 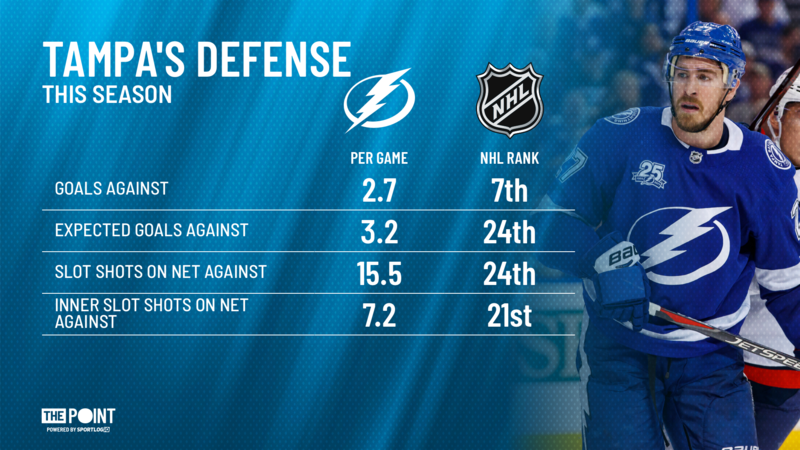 Tampa has been a buzzsaw all year with their juggernaut offense and a Vezina-caliber season from Andrei Vasilevskiy. Luckily for the Habs, one of those two will not take the ice at the Bell Center. Since the Lightning essentially clinched a playoff berth in November and are on the second half of a back-to-back, they’ve decided to give their starter a rest and, with usual backup Louis Domingue injured, gave the nod to Ed Pasquale. This will be Pasquale’s second career start. In his first appearance earlier this season, he allowed five goals on 24 shots in a loss against the Red Wings. This is great news for Montreal. Tampa might have the 7th-best defense in terms of goals against, but for a team this dominant, it’s surprising how much of it is due to great goaltending rather than great defense. Those numbers don’t take into consideration the fact that reigning Norris winner Victor Hedman will be absent today, following an “upper-body injury”. Tampa is fundamentally a high-event team. They generate a ton, but they also give up a lot. In a game where they have nothing to lose and the Habs have everything to gain, Pasquale’s presence and Hedman’s absence could be game changers. If Carey Price can survive Nikita Kucherov, Brayden Point, Steven Stamkos, and co. on the other end, the Canadiens have a better chance to collect two crucial points than one might expect given the matchup on paper. The Leafs are fresh off a road win against the Islanders that clinched them a playoff berth. It was another emotional game for them, as John Tavares scored the game-winner in his second matchup in Long Island/Brooklyn since leaving the Islanders. They’re now guaranteed to face the Bruins in round one. Carolina, meanwhile, is hanging on to the last wild-card spot, one point ahead of Montreal. 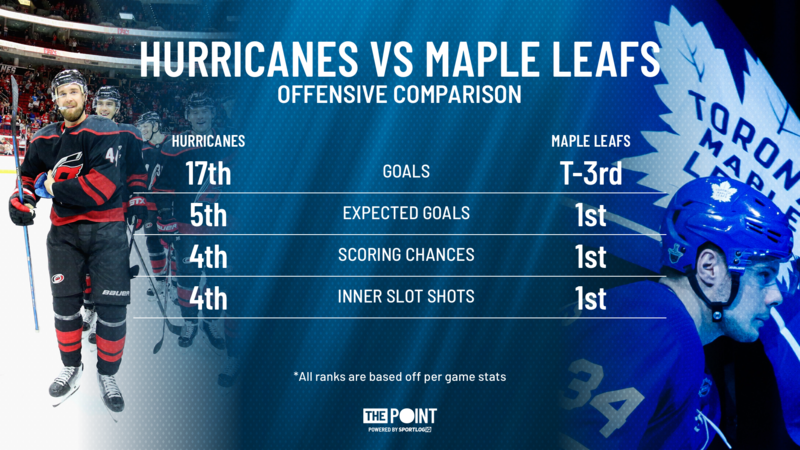 The Leafs and Hurricanes have split their season series so far, with one win on each side. Both games were decided by a three-goal margin and offense looks like it will once again be the name of the game. A couple of caveats from the graphic above. The Hurricanes were one of the worst finishing teams in the NHL to start the year, which drags down their overall goals for. Their acquisition of Nino Niederreiter coincided with their turnaround and, since he’s in the lineup, they’ve actually been a top-10 offense in goals per game. Second, since the Leafs are on the second half of a back-to-back, the ‘Canes have a similar stroke of luck to the Habs and will be facing Toronto’s backup, Garret Sparks. Sparks has been a subpar goalie this season, posting a 0.34 actual to expected goals mark. This means he gives up about an extra goal every three games compared to league average goaltending. The Leafs are the better team on paper but, given the circumstances, this is probably the best time for the Hurricanes to face Toronto. After making the biggest splash at the Trade Deadline, the Columbus Blue Jackets sent a message to the league that they were all in. Almost immediately the wheels completely fell off. The Jackets looked like they’d completely forgotten how to put the puck in the back of the net. Luckily for them, their starting goalie, Sergei Bobrovsky has recently found the form that won him multiple Vezina trophies. 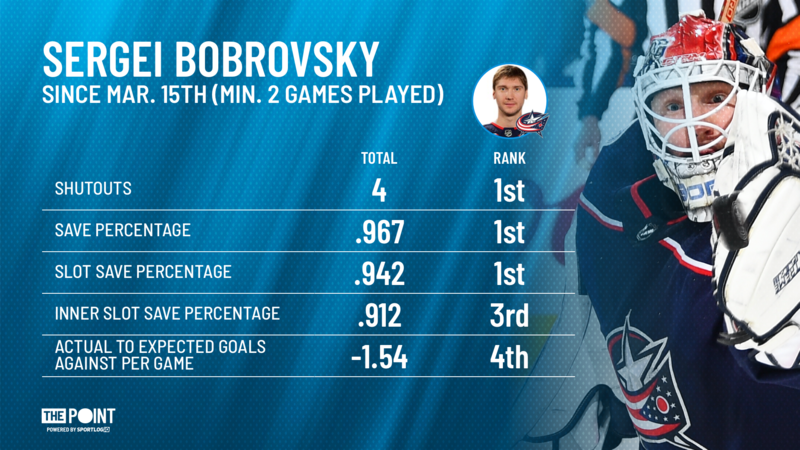 Since March 15th, Bobrovsky has four shutouts and now leads the league in that category with nine. Thanks to Bob’s stellar play and the offense starting to find some chemistry, The Jackets are now one of the hottest teams in the league with five straight wins and a record of 7-2-1 over their last 10 games, the best second-best record behind only Tampa Bay. In their previous encounters, each team has won at home and lost on the road which is to Columbus’ advantage tonight since tonight’s matchup is being played in the Blue Jackets home barn. To get it done tonight, the Blue Jackets will need to shut down that big line of Patrice Bergeron, David Pastrnak, and Brad Marchand but more importantly, they’ll need to break through Boston’s stingy defense. Over the past month, the Bruins have been a top-five team at limiting scoring opportunities from their slot. Their only real weakness has been when teams dump the puck in on them and force their defense to turn and go get it. A good strong forecheck will be the best way for them to force turnovers and create scoring chances off of them. The good news for the Blue Jackets is that the Bruins have been a .500 team lately and are only three wins above .500 on the road this season. 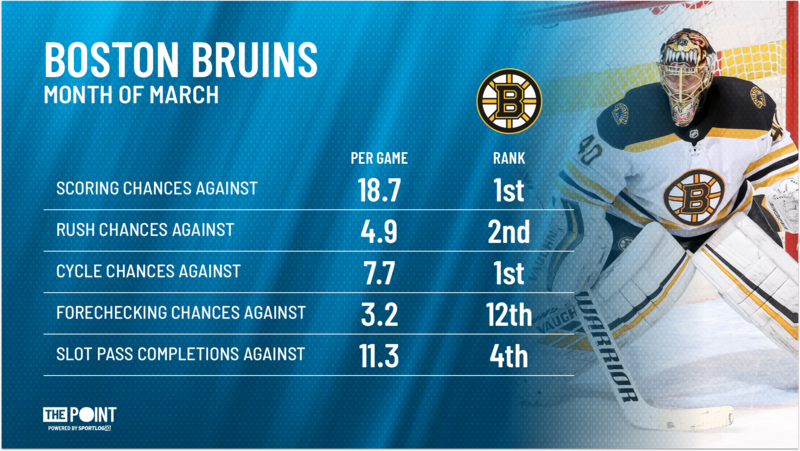 The Bruins are a dangerous team but they could get caught looking ahead to their first-round matchup against the Leafs. The Blue Jackets have been clutch lately with a big win over Montreal recently and have now moved past Carolina to avoid having to play Tampa Bay in the first-round. If they can continue their hot play they should be able to hold off both Carolina and Montreal, gifting them the defending Stanley Cup champions, Washington Capitals, as their first-round opponent.